The rise of passive investing, and index investing in particular, is a dominant trend in for-profit investing. Are the core benefits and concepts of different types of passive investing worth thinking about for philanthropy? 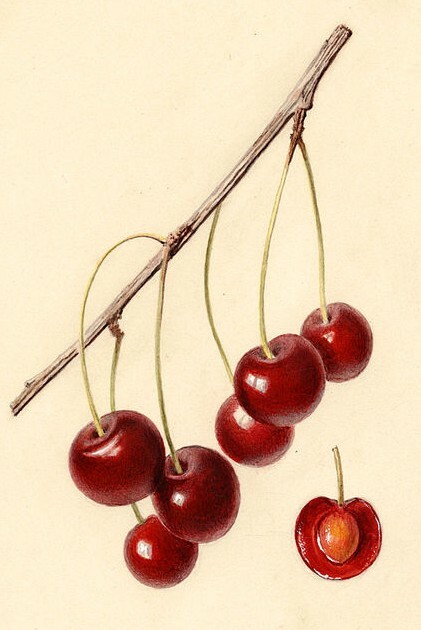 Image of Marasca Moscata variety of cherry (Prunus avium) by Louis Charles Christopher Krieger. 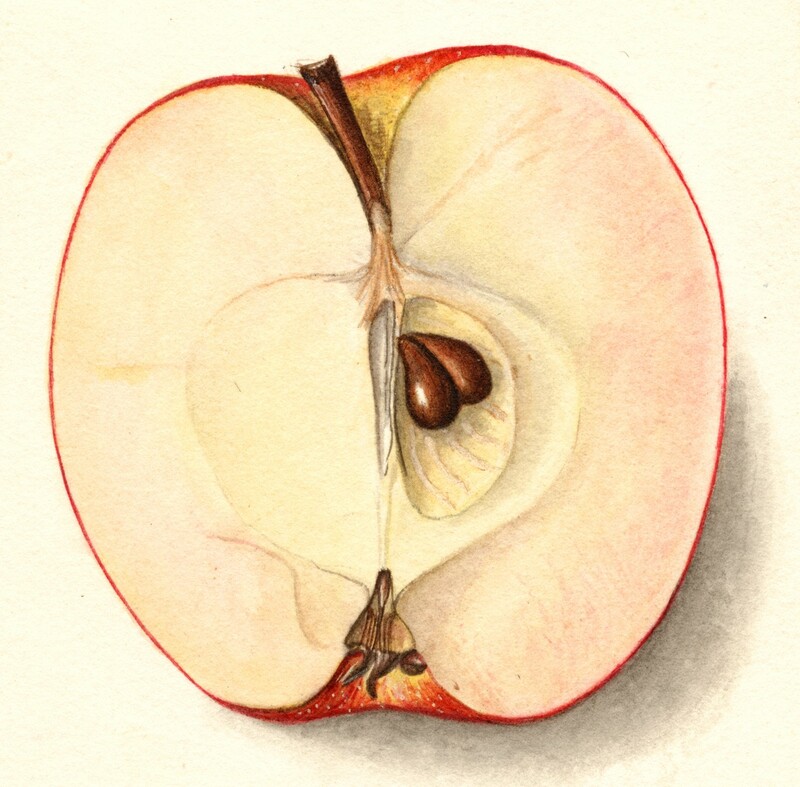 This image is part of the U.S. Department of Agriculture Pomological Watercolor Collection and is in the Public Domain. It has nothing to do with the subject of this piece, but I love these images and they brighten up an otherwise drab article. This post is long, so here’s what to expect: I give a bit of background about passive for-profit investing and then some examples about how this type of investing might have lessons for philanthropy. I also advocate for more public philanthropy as a way of encouraging more giving. I’m interested in furthering my thinking on this, so please tell me where this resonates and where it doesn’t. Respond here or @reply on Twitter @amac. The prototypical active investor researches individual companies, macro-economic conditions, and other factors to make individual investment decisions on the basis of his own research and analysis. The basic idea is that the active investor seeks to make better than average investments through knowledge and skill. The active investor seeks to beat the average investment over some set of possible investments in companies or “index.” An example of an index of US publicly traded stocks is the Wilshire 5000. An active investor might seek to beat the Wilshire 5000 by investing in the US stocks he believes will perform better than that average. The problem is, most active investors do not beat the average. And, people who invest with active investors pay money to not beat the average (fees can be 2% and higher, and they add up). Taking time to choose an investment, or an adviser, or even to invest or not can cause a delay in investing that can also be costly. As a result, many smart people, including Warren Buffet, advise smaller investors to invest passively instead. Passive investing is a spectrum that can range from choosing a set of criteria and then investing in all stocks that meet the criteria; to investing in mutual funds that are similarly structured; to choosing an allocation for investments but not individual stocks; or, to simply choosing an index or set of indexes to invest in. Trying to time the market is another common type of active investor problem that can be countered by the more passive approach of investing a set amount every month, or buying and holding. The result of using more passive approaches is that an index investor can simply choose to get average returns, and because of the low cost and diversified risk of this approach, over the long term, these investor trounce most other investors [pdf]. Over time, passive investing and indexing has grown so fast that Moody’s has predicted it more than half of all money invested in the public markets will be passively invested by 2024. Image of Apples (scientific name: Malus domestica), with this specimen originating in Geneva, Ontario County, New York, United States by Ellen Isham Schutt. Public Domain image from the U.S. Department of Agriculture Pomological Watercolor Collection. The trend in investment in non-profits seems to be going the opposite way. Smart people advise holding non-profits accountable to measurable results, doing significant research, and investing in a small set of non-profits where your contribution can make a tangible difference. I don’t disagree with this advice if you are the Bill & Melinda Gates Foundation, or Reid Hoffman. If you are an expert in an area, are willing to do the research, and follow up, by all means, please do. But most people do not have those resources, and those types of messages may intimidate and discourage people from giving. For the rest of us, some form of more passive giving could be a useful way to increase our giving and get better results. One simple approach that is mostly active but accessible to smaller givers is to use an advisor to help you make gift decisions. Community Foundations and other donor advised funds can distribute the cost of their research and expertise over a wide set of people, letting you provide a vague donor desire, such as: “I’d like to contribute to helping victims of domestic abuse in the Bay Area” and the foundation can help find a good charity for that purpose. Buffett gave his money to the Bill and Melinda Gates Foundation for them to decide how to disburse. For more reasonably resourced givers, some private foundations that make grants also accept donations, such as the San Francisco Community Foundation’s Rapid Response Fund, but many grant making foundations do not have an easy way to accept small value donations. Another way to get the benefit of a professional team that you admire is to simply mirror their donations as much as you can. For example, the Hewlett Foundation publishes its list of grantees and grants, including by specific programs, such as its SF Bay Area program. There is definitely room for improvement in the number of philanthropists and foundations who are public about their giving, and also to make it easier to mirror their giving by providing links to the grantees public donation pages (more on that below). Public Good is the name of for-profit benefit corporation that has taken this a step further by making it easy for individuals to give to a set of charities recommended by others as part of “campaigns” in one simple step. For example, you can find and give to a bunch of sets of charities that Univision recommends, including for environmental justice. Public Good’s current use cases focus on media organizations being able to recommend bundles of charities as actions to take at the end of cause related articles but their model has promise and seems pretty extensible. Group giving allows a group to increase its impact by pooling resources and research, and deciding together which philanthropies to invest in. This is still quite an active means of investing but can be an effective form of group commitment and research-cost spreading while making giving social. Battery Powered and the Full Circle Fund are examples of this type of giving in the Silicon Valley community, but there are many more. A set of traditional approaches that combine using the expertise of others to choose individual charities as well as increasing the diversification of your charitable giving are: giving when asked and using matches. Some amount of charitable fundraising is done through an in-person ask. Having done some of this, I can tell you that asking someone else to donate to a charity is something that I find difficult, but important. The difficulty creates a significant threshold to me asking for people to give. That means I only ask if I have researched the charity and feel strongly about the value of donating to it. As a person being asked, if you understand this dynamic, asks from people who you are connected to in some way allows you to use their vouching for a charity to free-ride off of their research and qualification costs. People you are connected with and trust for another reason can suggest charities you might not otherwise think about, providing an additional diversification benefit. Of course, this only diversifies to the extent your friend or other group is diverse, but I have found some surprising charities in this way. If you look at asks as a passive investing and diversification strategy, and budget to respond positively to some amount of them, you might also start appreciating being asked rather than dreading it. Another traditional way to signify one’s commitment to the value of a charity is to match donations. Matching likely increases the value of your donation by increasing the amount others donate but one reason I like matching is that it is a socially acceptable way to signal the social behavior of giving so that others can see that their peers give. There is LOTS of research that suggests that exposing positive peer behavior is one of the most effective ways of changing behavior (more on that below). The broader, more public request of a match also means that people can see a more diverse set of them, for example, on social media. Two recent examples from my Twitter feed are Fred Wilson’s Monthly Match and Greg Doucette’s charitable matching. I trust Fred and Greg, so their recommendations combined with their putting their money behind them, are valuable and actionable. One way to combine the diversification value of responding to asks with the increased donation benefit of a match offer is blind matching. In an ordinary match, a person offers to match up to some amount to a specific charity. A blind match offers to match a certain amount of money to any qualifying charity. For example, a donor could pledge to match up to $10K to any 501(c)3. Many companies do this for their employees. For example, Google matches employee donations up to $6,000/year and reportedly facilitates employees matching each other’s donations as well. Blind matching might also be an effective way to better align donors with communities they are trying to positively affect. For example, a blind match to what local donors were giving to in New Orleans after Katrina might well better serve that community than a donation to a charity that was making the news in San Francisco. Another approach might be to proportionally match a set of donors. Imagine being able to donate $100 to the basket of charities that people living in Flint, Michigan are currently donating to. Or imagine matching the donations of people of a certain faith, or under a certain income level. Note that this has some similarities with the GiveDirectly approach as well. 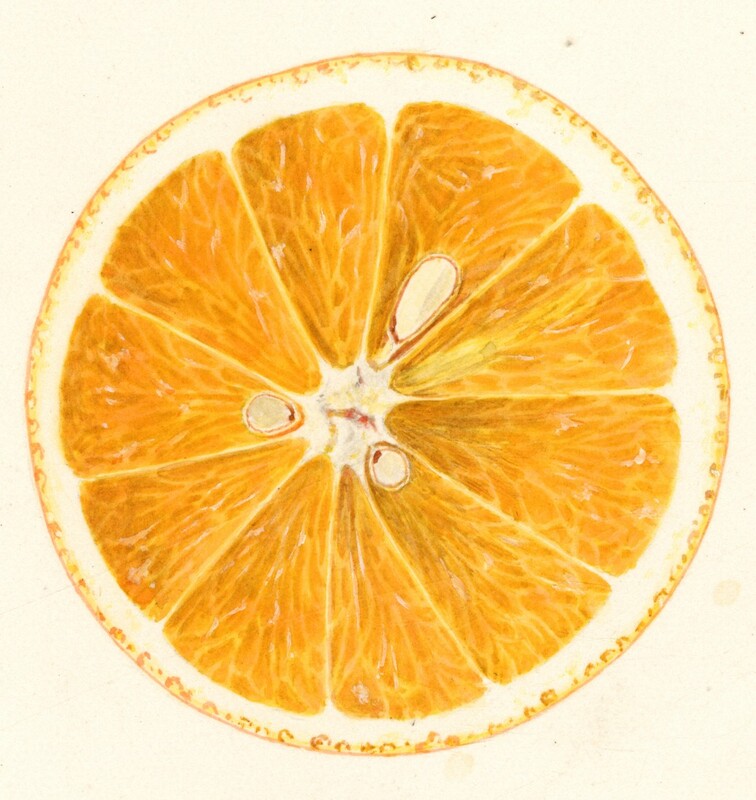 Image of the Valencia variety of oranges (scientific name: Citrus sinensis), with this specimen originating in Altadena, Los Angeles County, California, United States by Royal Charles Steadman. Public Domain image from the U.S. Department of Agriculture Pomological Watercolor Collection. Of course, the approach that would most closely mirror index investing would be to be able to donate to an index of charities with the most liberal possible choice criteria. Just as in the early days of for-profit index investing, there are some significant challenges that would need to be resolved, such as how to determine the universe of potential charities, how to determine the proportional representation of each, how to deal with tiny fractional donations as this approach scales, etc. Also, just as index investing doesn’t solve all the problems of the for-profit market, such as overly short-term thinking, index philanthropy wouldn’t solve a bunch of important charitable issues, such as over investment in “name brand” charities and lower investment in new charitable ventures. Index philanthropy is as radical a departure from the current view of smart, result-driven philanthropy as index investing was from active investing when it was introduced in the late sixties and seventies. However, it shares many of the same benefits of index investing. Namely that it removes the cost of trying to beat the market and harnesses the wisdom of the crowd to help an individual get over the hump of contributing. It also reduces the risks of choosing an under preforming charity as an individual would be giving to a wide variety of different charities. Some will certainly fail but many will do well. Another way to think of indexing is systematizing or creating a type of algorithm to help guide and encourage charitable giving. An example might be to allocate 20% of your charitable giving to each of a set of causes that are important to you and try to use an inclusive approach within those general constraints. These smaller indexes that align with your charitable passion could diversify your giving while keeping it tied to your passions. Anyhow, there is a lot more work to be done to flesh out how and whether index philanthropy would work. If you know about research in this area, please let me know. I don’t know if index philanthropy is a workable concept, but based on the enormous success of index investing, it seems important to explore. Furthermore, the various steps towards more passive philanthropy identified above that lead to easier, more diversified philanthropy can be used by people now. A good index investment strategy also tries to reduce the risks of mis-timing an investment by setting up an investment schedule. Just as picking individual stocks has been shown to be a generally losing proposition, so has picking the right time to invest. We are a long way from being able to make a similar claim about charitable giving. If you are trying to make a positive difference in the world through charitable giving, I don’t know of a study that gives good guidance as to whether there is value to be had by spreading contributions evenly. What I do see is that many have trouble starting to give. Or getting money they’ve earmarked for charitable giving into the hands of charities to actually do good. Here again some techniques from the for-profit world might be useful, even if they only lead to more giving, not necessarily better giving. Have a schedule. Write it down. Try to make it self-effectuating. For example, you could create or subscribe to a bundle of charities through Public Good and set up a recurring donation to that bundle. I’ve found that it also helps to have a goal with respect to the amount you will give. For example, many religions expect their members to tithe, or give 10%. Other formulas and pledges exist as well. The point isn’t so much the amount you decide to give but that you decide to do it and stick to it. I’m not an expert. I’m struggling to figure this out too. But, all of this is driven by a view that charitable organizations do some amazing work and that funding them more would be a good thing. I’m not saying that companies and governmental organizations aren’t important too, but that many charities could effectively use more money to provide positive impact. Perhaps the biggest single change that we could each make that might help us all give more is talking about it more. As described above, matching is one great way to do this, but so are making pledges, or just listing the charities we contribute to (some of mine, both direct and through a donor advised fund, are listed here). Imagine a world where listing charities was as common as blogrolls used to be, or where there was an AngelList for charitable giving complete with syndicates and funds. 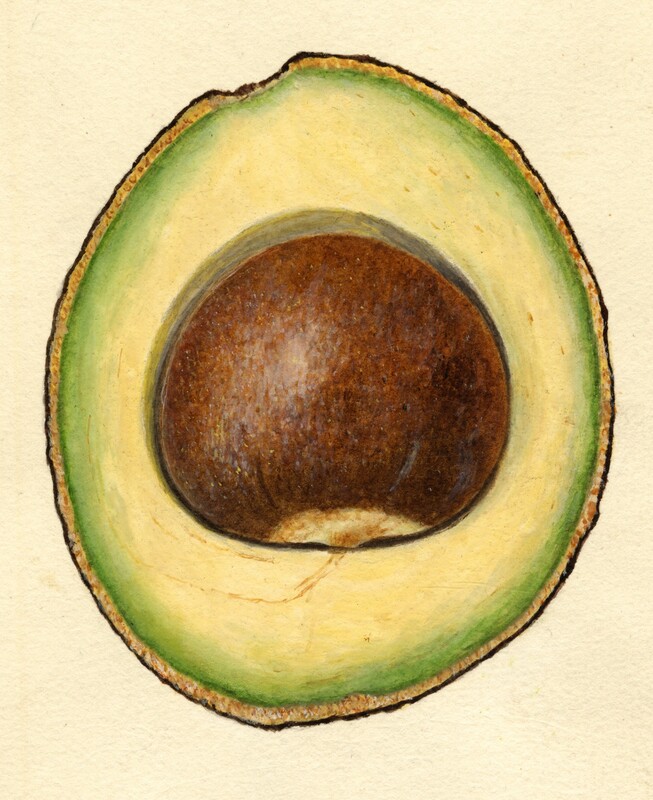 Image of the McDonald variety of Avocados (scientific name: Persea), with this specimen originating in Florida, United States by Amanda Almira Newton. Public Domain image from the U.S. Department of Agriculture Pomological Watercolor Collection. Formerly Twitter, Google, and US Govt.